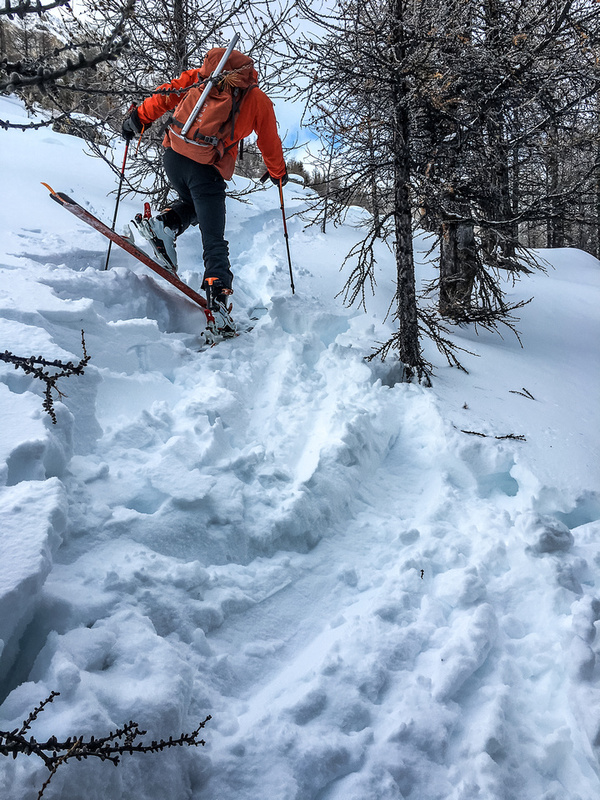 Difficulty Notes: The route passes under some severe avalanche terrain on Mount Redoubt and involves significant distance and height loss / re-gain. Be prepared for variable snow conditions too. Our day started off well with warm temps at the parking lot of around -3 degrees and a partially clear sky, which was totally unexpected until the afternoon. 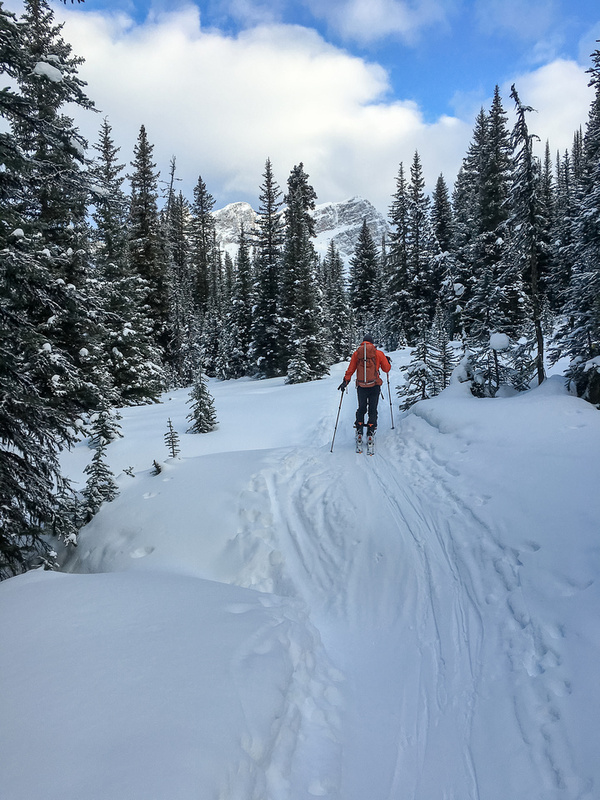 Mike set a furious pace up the Lake Louise ski-out and by the 2 hour mark we were grunting up the final ascent slopes to Boulder Pass with great views of Mount Temple opening up behind us. 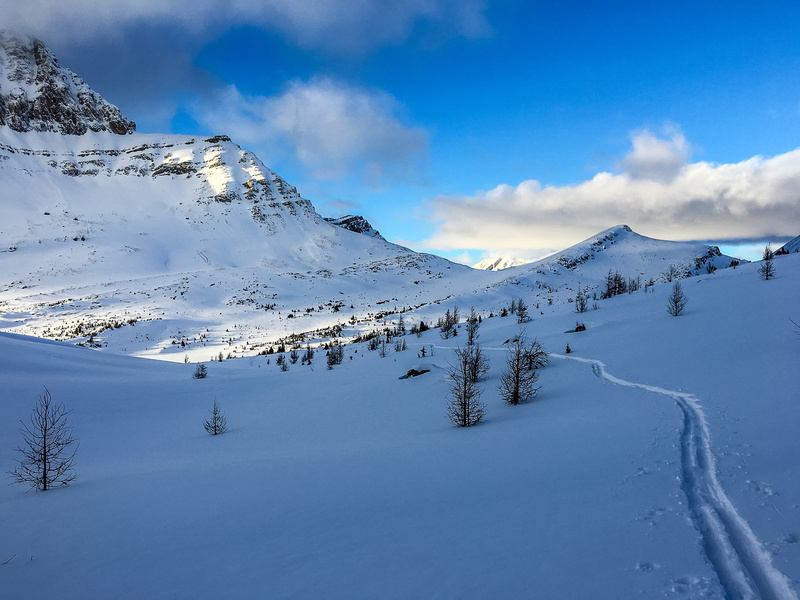 It helped that we had a great skin track the entire way to the pass – as usual, thanks to the Skoki Lodge snowmobile track set. From Boulder Pass we knew that the next 6km back around Redoubt’s steep east face, across Redoubt Lake and into the bowl on Unity’s northeast side would involve heavy trail breaking. We were right. We took turns breaking trail for the next 2.5 hours from ankle to boot top deep faceted and unconsolidated snow. 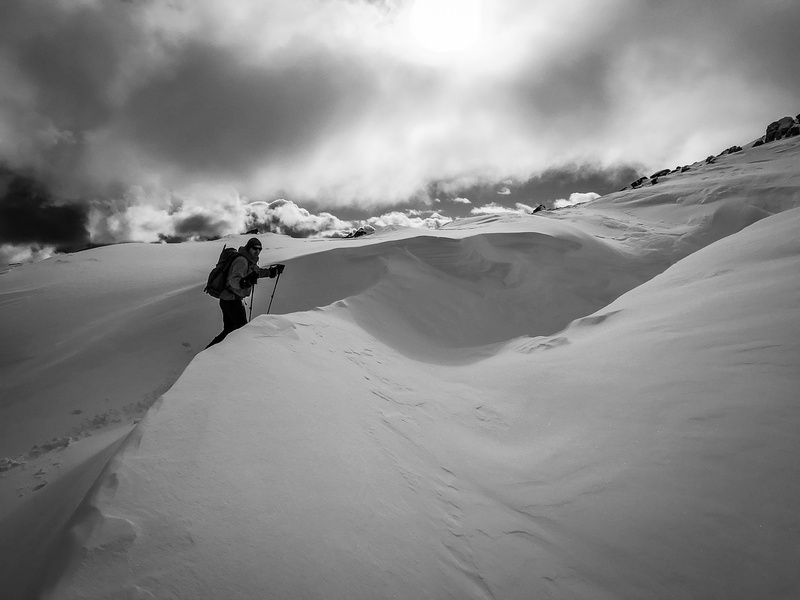 The few times we encountered a firm snow pack, it would settle on us with an audible “oomph” and visible cracks. This encouraged us to seek out the safest terrain possible. 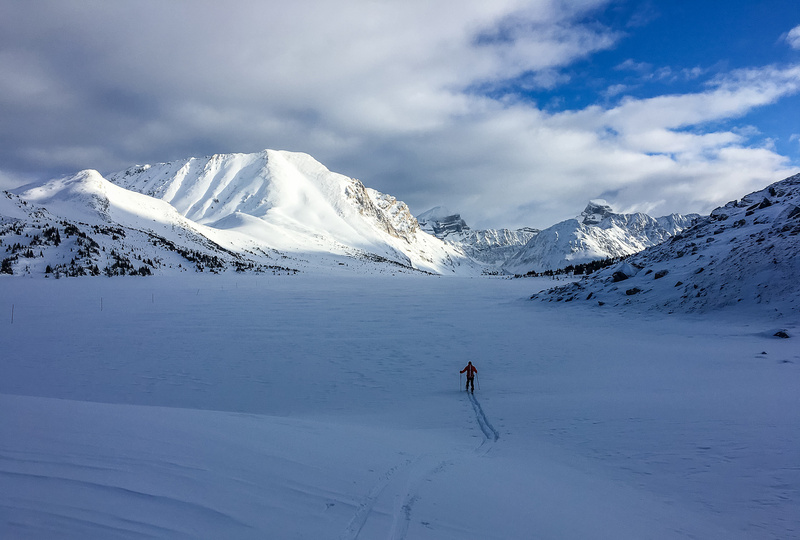 We gave the steep avalanche slopes on Redoubt’s east face a wide berth by hugging the east side of Redoubt Lake as we crossed it in deep snow. Crossing Redoubt Lake with our object in the far distance just left of center. Redoubt looms over us on our right. As we approached the end of the lake we had three choices for routes on Unity – which still looked a long ways off! We could descent 200m down the drainage from Redoubt Lake so the southeast. This would not be fun on return and would involve a long plod across more deep, unconsolidated snow towards Unity’s east ridge. A second option involved traversing some pretty serious avalanche terrain to our right, intersecting Unity’s northwest ridge and the col between Unity and Redoubt. This option was sketchy and we couldn’t even see the entire route from our vantage point. 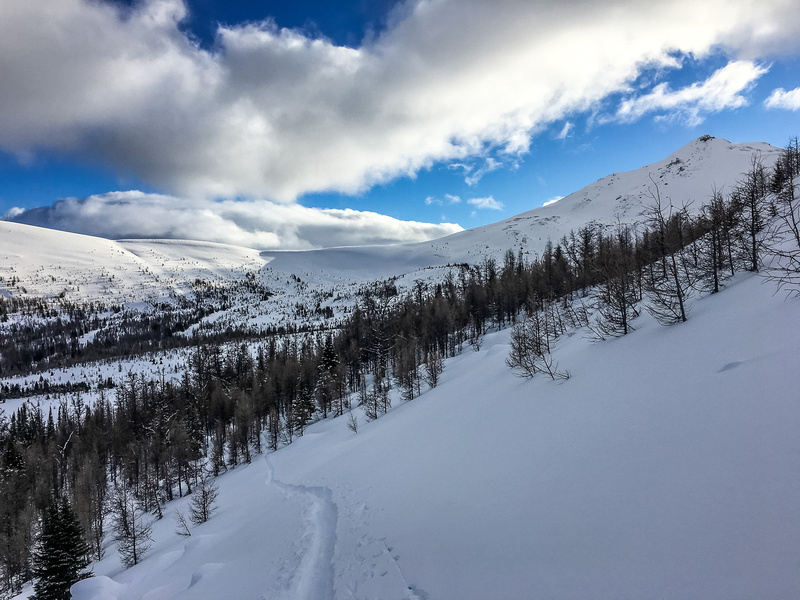 The third route – and the one we ultimately chose – involved a slight descent and traverse of a snowy bench running south towards the Unity bowl, eventually dropping all the way down steepish, bouldery, treed terrain to valley bottom. The advantage of this route over the first one was the chance to lay down a fairly gradual descent track that we could skin up on return without blowing a heart valve. 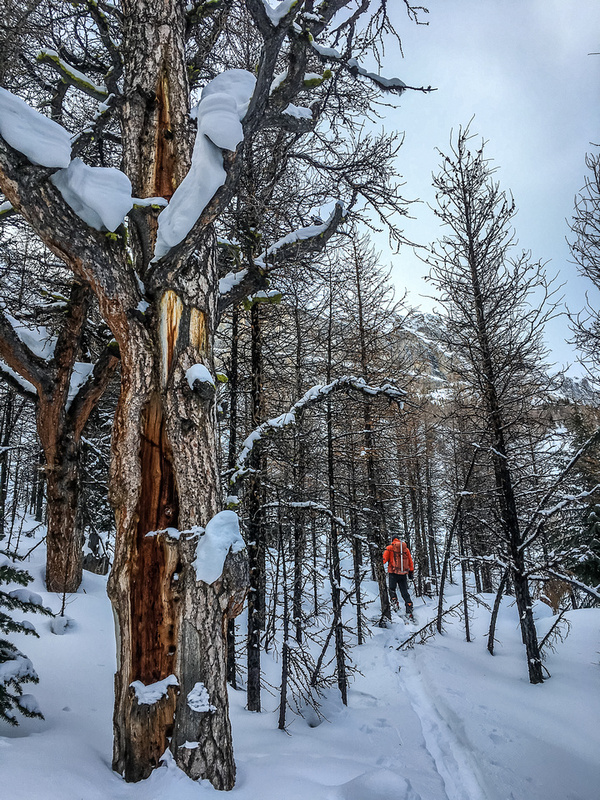 The tour was starting to feel long by the time we reached the gorgeous larch valley between Unity’s east and northwest ridges. The trail breaking was tough and I was feeling a distinct lack of energy thanks to being three weeks into a post-holiday diet. Mike thought it was at least 2pm and was shocked when I told him it was only 12:30! Fortunately (or unfortunately, depending on your point of view) we still had lots of time to make the summit. Here we had route choices and again, it was between the east and northwest ridges. To our right, we could ascend scree / snow slopes to the northwest ridge and join the ‘normal’ scramble route to the summit from there. The skiing didn’t look appealing with all that rock though. Across the larch valley, the east ridge looked skiable and easy to the summit, so that is the route we ended up choosing. Mike heads up Unity Peak’s ridge to the summit. 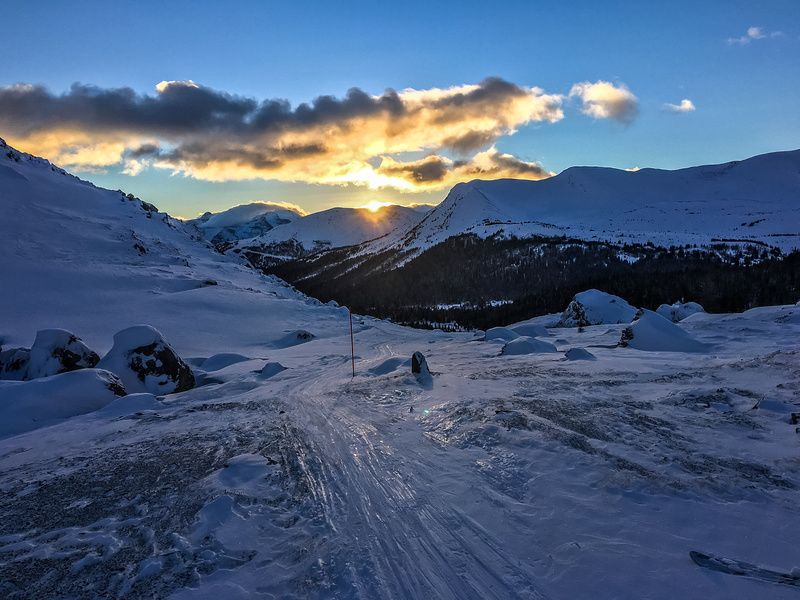 Near the summit – the views are getting better and better to the east over Baker Creek. 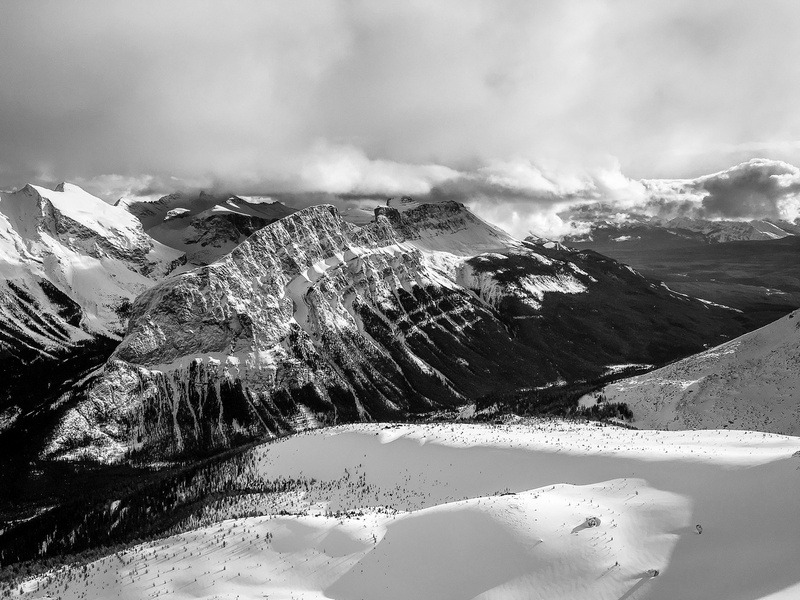 From L to R, Purple Mound, Lipalian, Wolverine Ridge, Wolverine Valley, Whitehorn, Redoubt with many Lake Louise peaks in the far background. The quick route to Unity is up avalanche slopes at lower right. Stunning views of Bulwark Peak and Protection Mountain over the Baker Creek valley. The slog back out was much easier than the slog in, thanks to a broken trail. 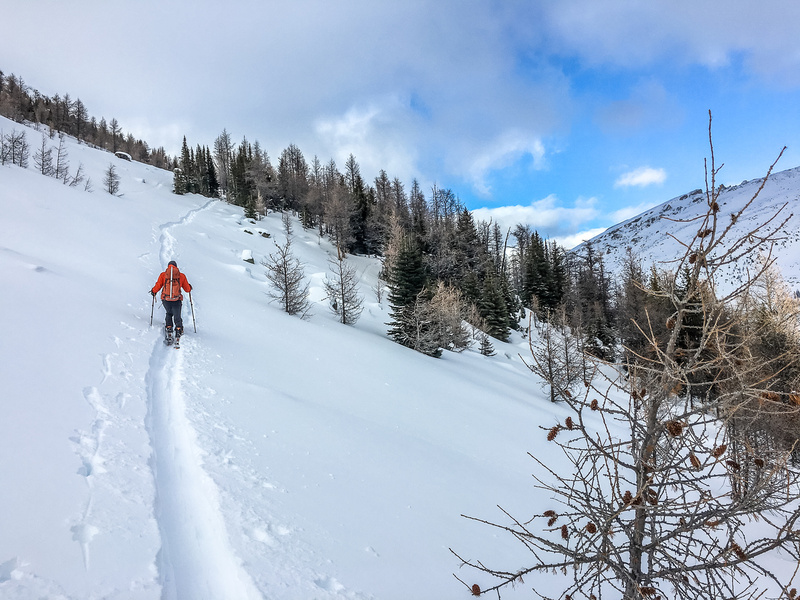 We made about 15-20 nice turns down the east ridge of Unity before skiing back across the larch valley and up our descent track to Redoubt Lake. 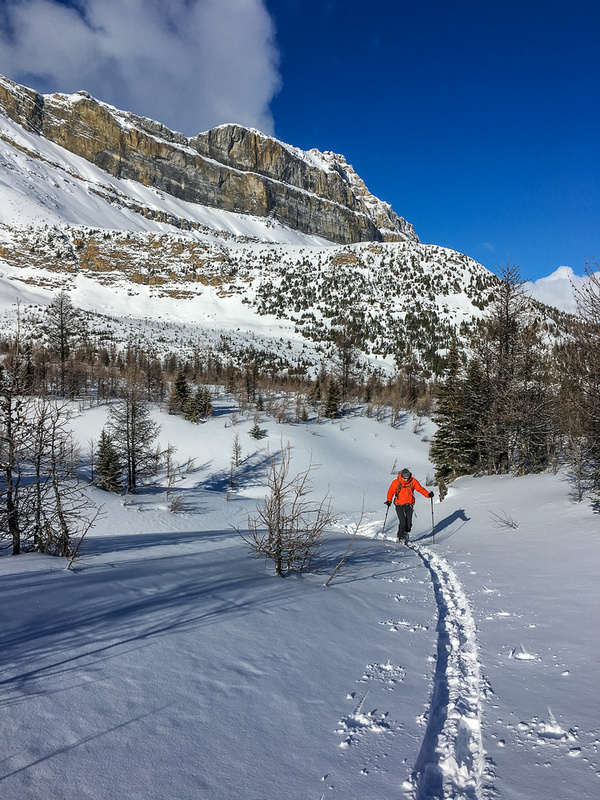 The stretch to Boulder Pass was made a bit shorter thanks to great lighting on the Skoki summits and before long we were taking off our skins for the 8km (mostly) downhill run to the parking lot from Boulder Pass. The ski out was fast, as usual, and we were very surprised to make it back just before dark with a round trip time of just under 9.5 hours. 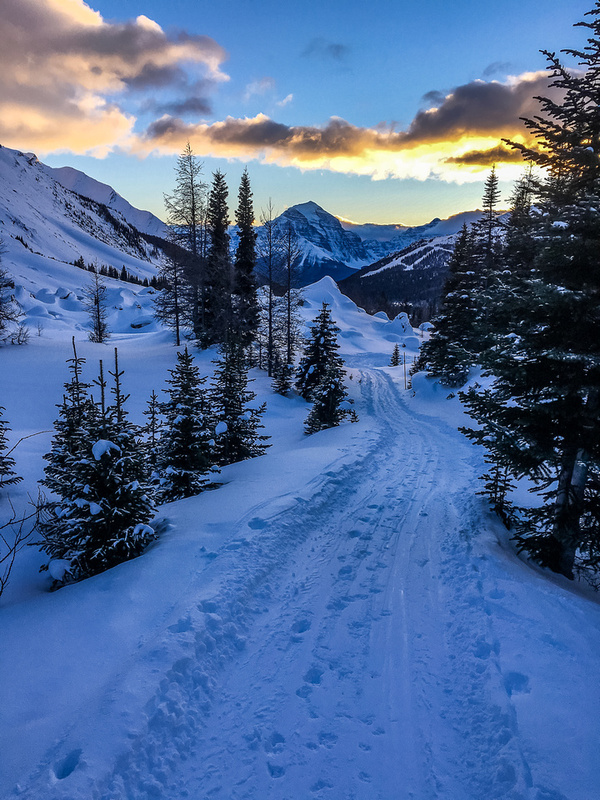 Beautiful evening near Boulder Pass with Mount Temple in the distance. 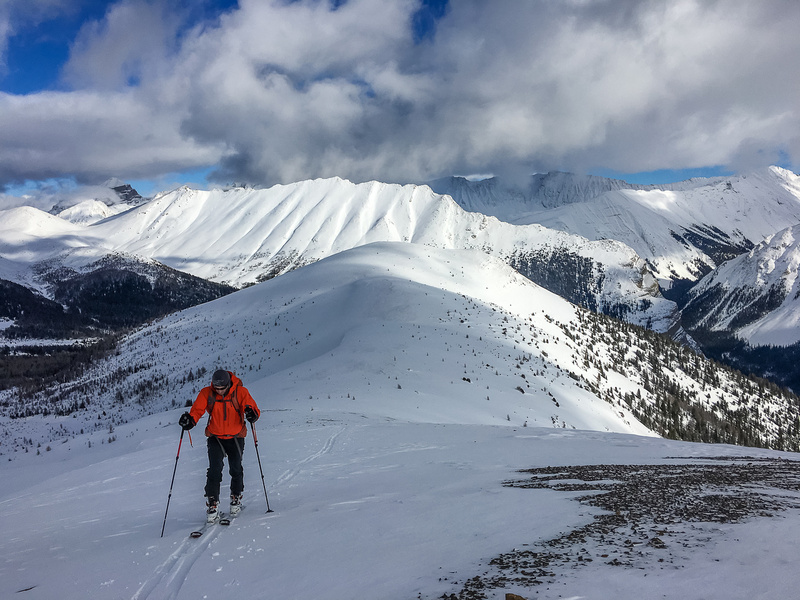 As much as I enjoyed the ski tour and summit views off Unity Peak, it’s probably better done as part of the Pumpkin Traverse (in very stable avy conditions) than as a single day trip like we did. 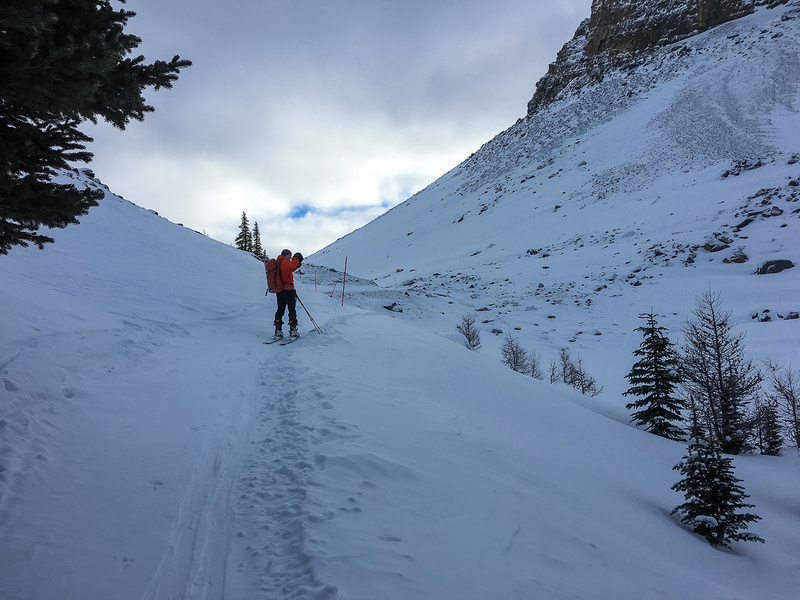 That being said, we did get some good exercise and managed to ski and summit safely in elevated avalanche conditions – something that’s not always easy to do. 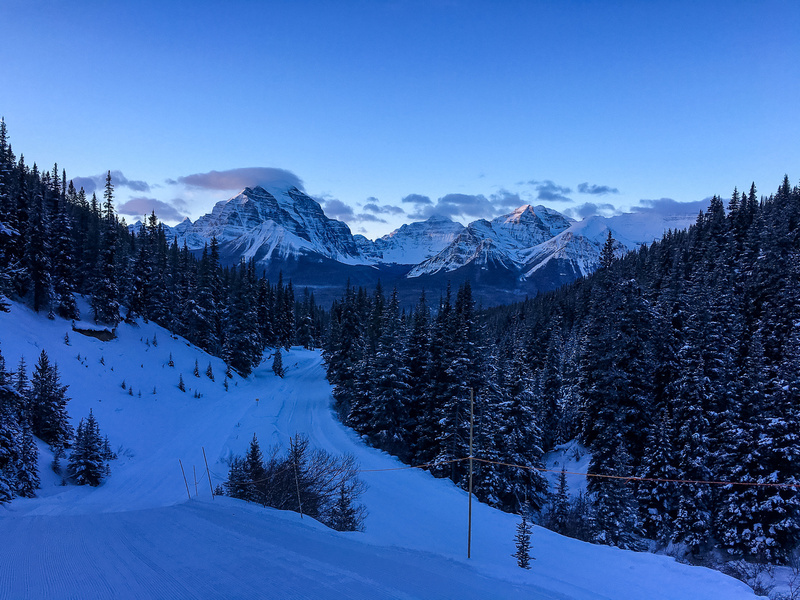 Gorgeous early morning light on the Lake Louise peaks, including Mount Temple, seen from the first steep section on the Lake Louise ski-out. Mike skis up the final icy, wind blown section before Boulder Pass. A view back down our approach from near the pass. The pass itself is a rather dreary and windswept place. 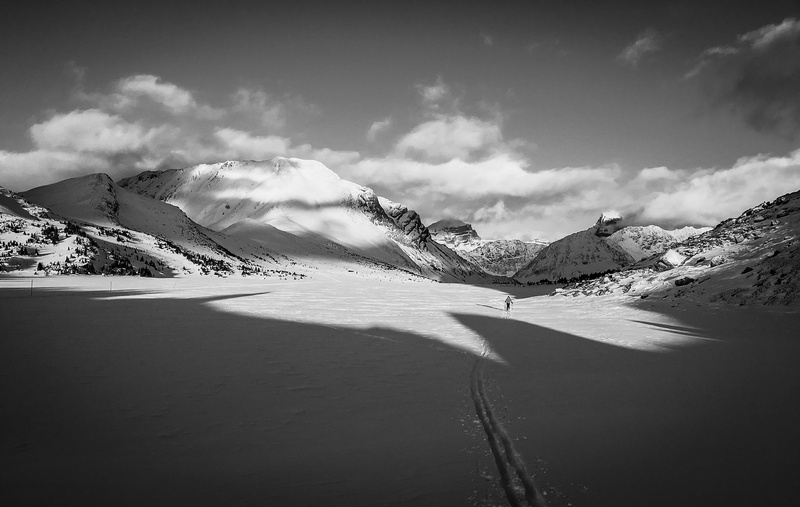 Mike starts breaking trail on Ptarmigan Lake. Packer's Pass Peak and Fossil on the left. 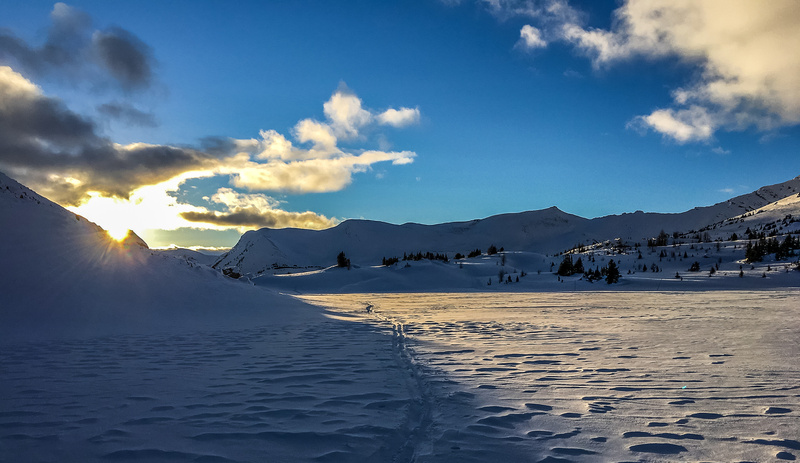 Our three route choices at the end of Redoubt Lake. 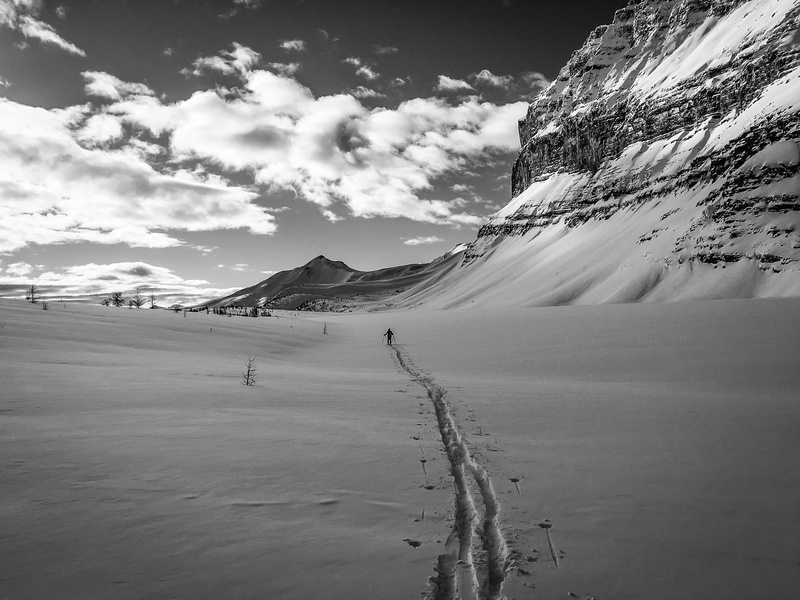 The trail breaking was tedious, but the scenery was breath taking - as usual for Skoki! Breaking trail towards the bench, which is hard to see here. Unity's east ridge is visible left of Mike. Sadly, we still had to drop down once we traversed the nose of the ridge, but at least we could trend down gently, providing a nice return skin track. Finally we bottom out in the larch valley to the north of Unity, which still looks rather distant at top right! Mike follows me up the east ridge of Unity Peak. Mike skis up onto the east ridge of Unity. Stunning views off the east ridge include Bulwark, Pulsatilla and Avens (R to L). 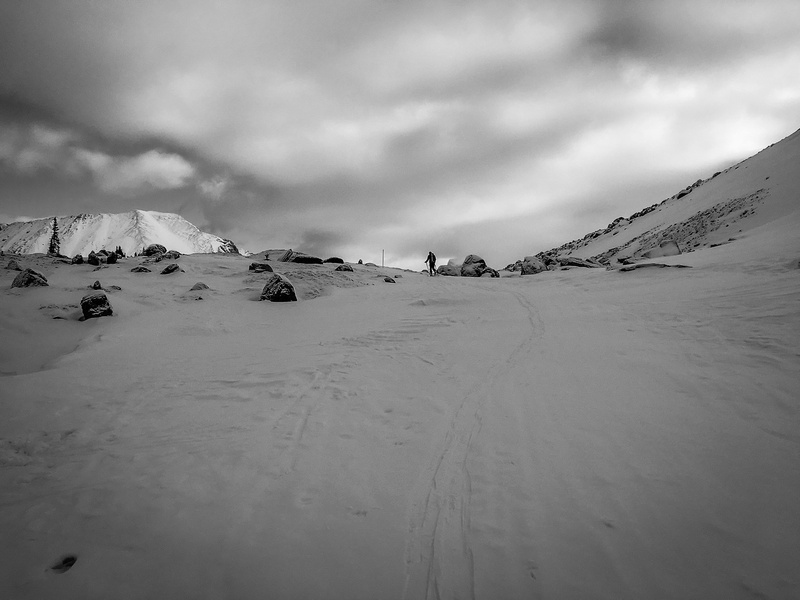 We skied up the east ridge until the snow was concrete and boot packed from there. We were planning to ski up this section but it was so hard we needed ski crampons, which neither of us brought along. Looking south and east off the ridge towards the Protection Mountain massif and Baker Creek valley. Looking down into the bowl north of Unity at Redoubt (L) with Heather Ridge at center and Anthozoan on the right. Near the summit - the views are getting better and better. The summit boulders and view over the Lake Louise ski resort. Purple Mound, Lipalian, Wolverine Ridge, Wolverine Valley, Whitehorn, Redoubt with many Lake Louise peaks in the far background. Mike approaches the summit with Heather Ridge, Brachiopod and Anthozoan in the bg. Mike heads for the apex of Unity with the Pumpkin Traverse to Purple Mound at lower left. It looks colder than it felt. Mike skis back to our return track off the east ridge of Unity. Tons of larches as we regain the nose of the intersecting ridge to Redoubt Lake. We found some old ski tracks on this slope - probably from a Pumpkin Traverse. Our descent track worked great on return. Unity catches some late afternoon lighting as I glance back across larch valley. Looking across the bench towards Redoubt Lake (out of sight) and Heather Ridge on the right. 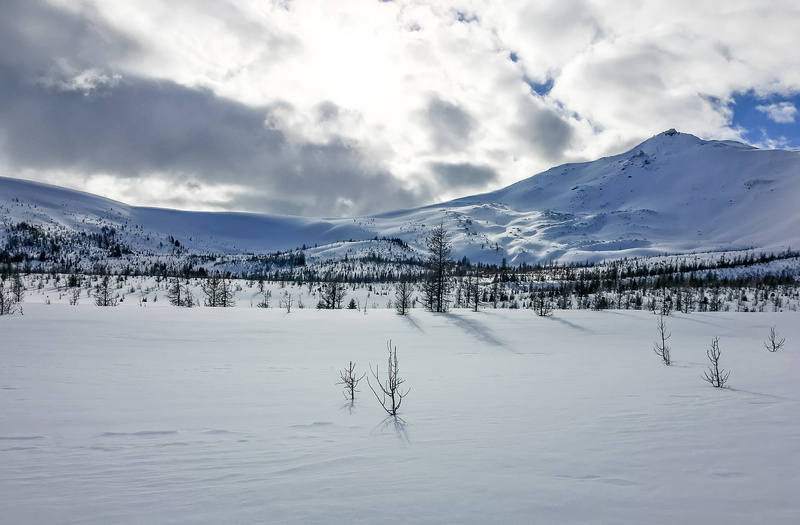 Nearing Ptarmigan Lake again with Redoubt on the left and Ptarmigan at upper right. Gorgeous lighting as we approach Boulder Pass across Ptarmigan Lake. Mike approaches Boulder Pass behind me. Ready for the 8km ski back to the parking lot - thankfully it's mostly down hill from here!